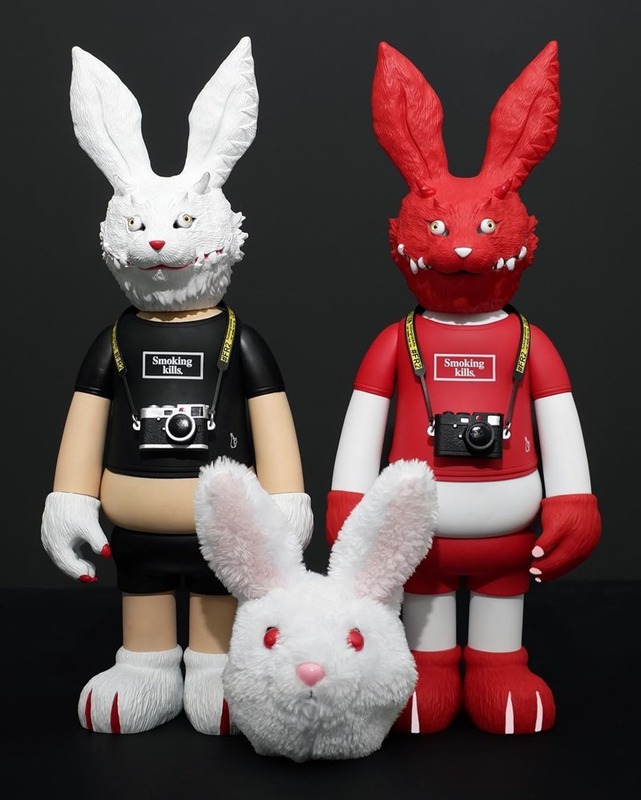 First shown as an unpainted proto at Beijing Toy Show and then near-final painted protos at Toy Soul last month, the wild FXXING Rabbits sofubi figures (~14.7") from bad boy photographer #FR2—infamous for his seductive photos of beautiful models—and T9G are now available for pre-order from Japan's Campfire crowd-funding site in the standard white edition and a Campfire exclusive Red+White edition for ¥19,000 (~$174) each. While this pre-order is limited to Japan only, the standard edition will soon be available in regular retail channels. We're also expecting to see the orange+black edition which was previewed at Toy Soul. The striking figures deliver T9G's feral interpretation of #FR2's bunny logo/alter ego and feature several signature T9G elements including the use of doll eyes and the removable plush head. As one might expect, the figures ship with realistic replica accessories of #FR2's Leica cameras right down to the branded camera straps. FXXING Rabbits checks all the boxes for collectors looking for T9G's over-the-top designs where the feral and the unusual override the kawaii trend. Surprise! Secret Base has released two new editions of their officially-licensed Hello Kitty Skull sofubi figure. New Yellow and Pink versions of the Balzac-designed toy are now available for ¥4850 (~$44) from SB's online shop. Overseas collectors should email [email protected] with the desired items rater than using the online ordering system. 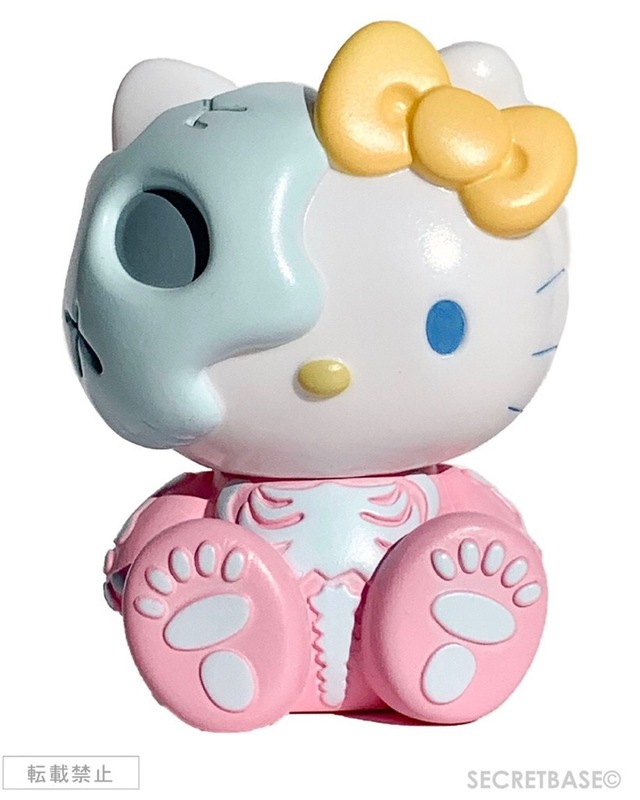 These new editions are the first new Hello Kitty Skull Editions in about four years. Jeremyville has collaborated with Beijing-based Yo!Gallery on a Year of the Pig polystone figure. The fun piece, celebrates 2019 with an elongated pig in the artist's familiar style. 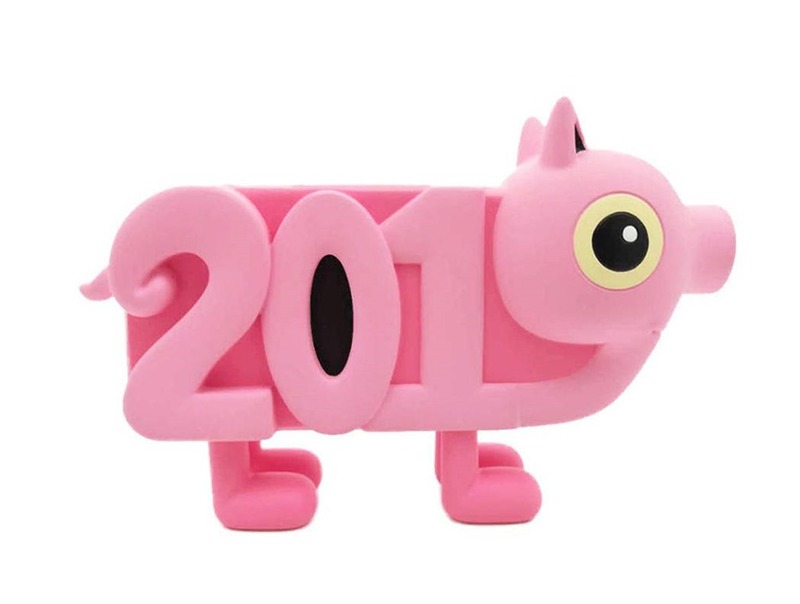 The left side of the pig features sculpted-in '2019' which cleverly incorporates the tail and the head. Limited to 200 pieces, the figure is available via Yoho!Buy for ¥1099 (~$162). Based on our attempts to register with the site, it appears that this figure may not be available to USA collectors at this time. Determined collectors will surely find a way. Inspired by a bygone era of vintage cinema, Tomenosuke is set to release the Mimi The Cannibal Girl B&W Film edition from Utomaru. A stylish riff on mono colorways, the minimalist edition of Cannibal Holocaust-inspired figure features a grayscale design with metallic silver mercury in lieu of blood. The B&W Film edition is slated to drop on 5:59 AM PST on Saturday January 26th 2019 from the Tomenosuke webshop. The new edition will also serve as the debut of the new packaging which shifts from the previous green palette to a purple/blue one. For the Year of the Pig, Woot Bear will release the brand-new Woot Bounty figures from Scott Wilkowski. 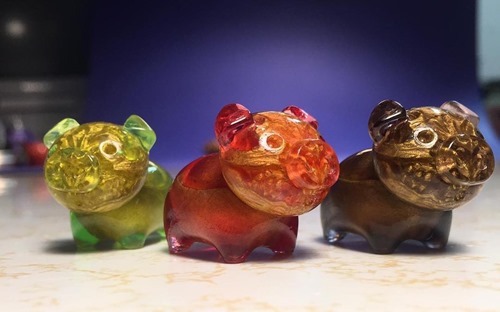 These double-cast mini resin pigs feature Scott's signature embedded skeletons. He's done a nice job with these little piggies which offer a unique way to celebrate the new year in style. Woot Bounty will be available on Saturday (1.19) at 12 PM PST from WootBear.com.